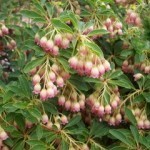 A mid-sized shrub with distinct upright stems. Blooms heavily in the spring with small creamy-white bell shaped flowers with some red veining, and edged red at the tips. Fall foliage color is a bright red, with some yellows. Avoid hot, dry soils. It does best in the same conditions as rhododendrons.